The biggest toy item this holiday season is by far and away the Nintendo Entertainment System. With millions of sets sold and millions more being sold for Christmas, shoppers are finding it difficult to find the hottest games in time for the big day. The two carts that top many kids’ most wanted lists are Super Mario Bros. 2 and Zelda II: The Adventure of Link. Both are sequels to million-plus sellers and are expected to set new sales records. The problem is that supply can’t keep up with demand and a microchip shortage has reduced available inventory by as much as 25% – leaving some parents in the unenviable position of coming home empty handed. Capcom continues to deliver the hits with their latest game, Bionic Commando. It combines unique gameplay mechanics (grappling with your bionic arm), great graphics and sound, and high-action scenarios to create a highly fun and memorable experience. Bubble Bobble is just the fourth NES game to receive a 10/10 from Nintendo Times. It deserves its place alongside Super Mario Brothers, The Legend of Zelda, and Contra. Anybody who is purchasing a Nintendo for the first time should start with these four titles. 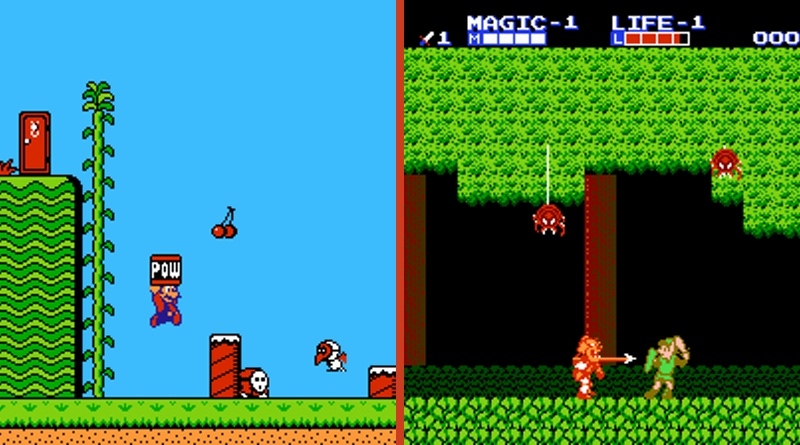 If you’re looking for a fast-paced action game similar to Super Mario Bros., Adventure Island should fit the bill nicely. It might tide you over until you can get your hands on Mario 2. If you are looking for a great action game, and particularly one where you can play co-op together, Jackal is surely one to consider. If you loved and played a lot of Contra, Legendary Wings, and Life Force – Jackal is right up your arsenal. Capcom has another winner with Legendary Wings. It features a wonderful weapon system, two types of scrolling levels, plenty of secrets to find, and best of all it allows for two-player simultaneous gaming. With memorable music and detailed graphics, this is one of the best shooters on the system right now. Despite only having 8 teams, R.B.I. Baseball offers enough variance. The great play control, solid graphics, and pleasant music only serve to enhance an already great baseball game. I would highly suggest R.B.I. Baseball over JLN’s MLB or Nintendo’s Baseball. This is another perfect pick up and play game for a fun half hour gaming session. The controls feel great and although the game is difficult, it is not frustrating. I love all the cool special items included and the challenge of avoiding the hazards. The graphics are colorful, and the music and sound effects are amazing. You’ll more than get your money’s worth out of this game, especially if you try for the gold trophy on each of the 24 tracks. Ice Hockey is a simple game without a lot of flash or special features, but is still a tremendous amount of fun, and one of the best 2-player games to date. Even casual sports fans should enjoy this one. This is a perfect game to own if you have a family who is into gaming. Contra is the best 2-player game ever created for the NES. The action is non-stop and the graphics and music are impeccable. Spot-on controls, exciting level design, and fun weapons add up to a must-have Game Pak. Konami has done it again! Capcom has squeezed in a gigantic and challenging universe filled with originality and fun that’s unrivaled on any other system. Mega Man offers innovative ideas like a stage select that sets it apart from the rest. Don’t let the horrific box art put you off – you should seek this one out and add it to your library. The Goonies II is an action-packed adventure game where you must rescue your fellow Goonies from the evil Fratelli clan. You’ll find special weapons, tools, and items to aid you on your epic quest – spanning a deep underground ocean to a creepy shack in the woods. Do you have what it takes? If you’re looking for an incredible single player gaming experience, look no further than Mike Tyson’s Punch-Out!! This game is a must-play and definitely a must-own. Even if you have zero interest in boxing, or in sports for that matter, I am certain you’ll find something to like here. For a competitive head to head game there are few better options than this. Any fan of basketball will surely want to play Double Dribble, and because of its high replay value, you’re certain to get your money’s worth. Metroid is a fascinating sci-fi adventure game that has you exploring an alien planet packed with exotic creatures, exciting power-ups, and constant surprises. Can’t find Zelda II? If you or your kids haven’t played the original, then you should! The Legend of Zelda is a must-buy for every Nintendo owner. It’s loaded with amazing treasures and secrets to discover, excellent gameplay mechanics, and is easily the longest and most enthralling game ever created for the system. Rarely does a game’s art direction and audio come together to form such a cohesive experience. Castlevania is a great example of what can be achieved with home console technology, and a real win for the NES. If you enjoy classic horror movies, this game should thrill you.